This project has been “in the works” for a while. I’ve had the pedal working for sometime but finally got around making the modifications to make it a modern pedal. Let’s start with a bit of backstory: Last summer, my wife and I were helping to clean out my late father-in-laws tool shed. He had a lot of stuff and a lot of that stuff was entirely random. 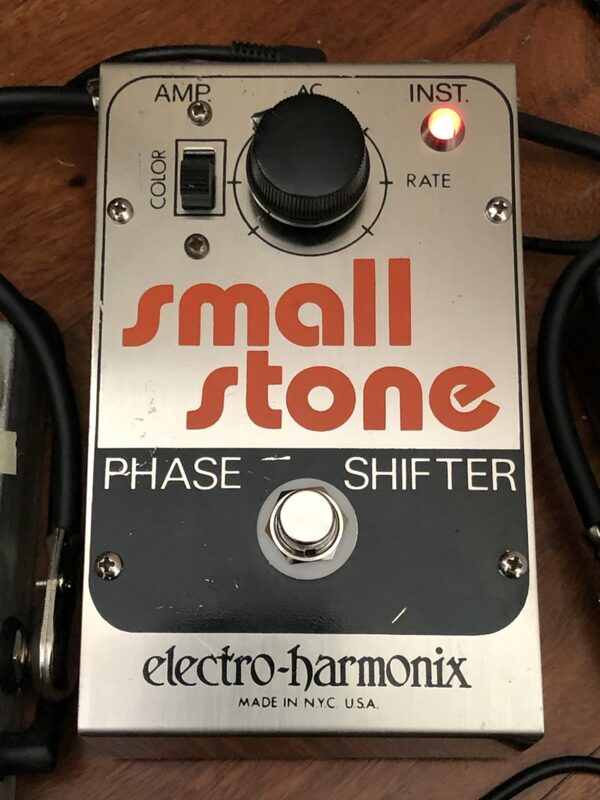 One such item was a late 70’s Electo-Harmonix Small Stone phase shifter. It was in decent shape, but upon opening it, the 9v battery corroded and ruined the battery snap. So it was unusable as-is. 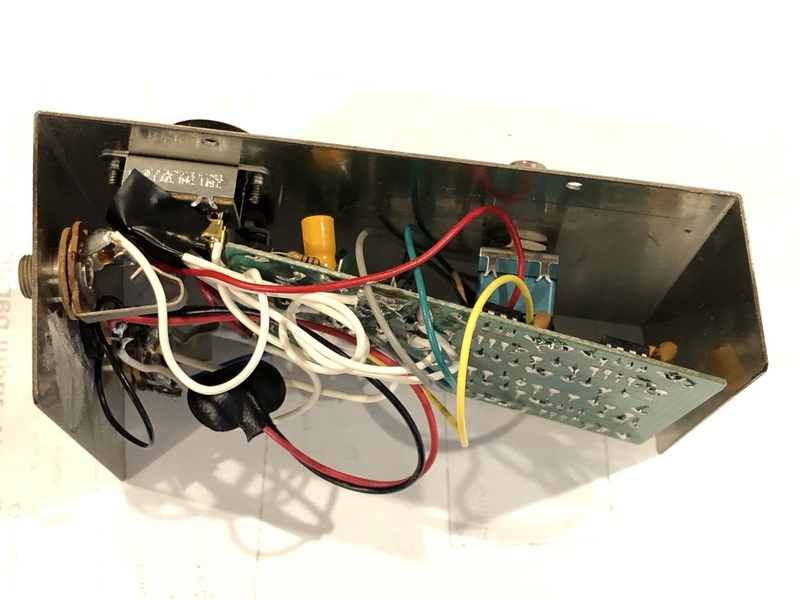 There’s not a definitive way to date it, but the pot is labeled 1377825, which means it was manufactured the week of June 19th (25th week) of 1978 by CTS (manufacturer’s code 137). So the pedal was likely build and sold in late 1978 or 1979. The Small Stone is the other phaser sound from the late 70’s, where as the MXR Phase 90 is the one that Eddie Van Halen made famous (I have some theories on why that might have been, too.). That being said, it’s a great sounding phaser. I’m not a fan of the color switch on, personally1. But with the switch off, the effect has got a rich, space-y sound. 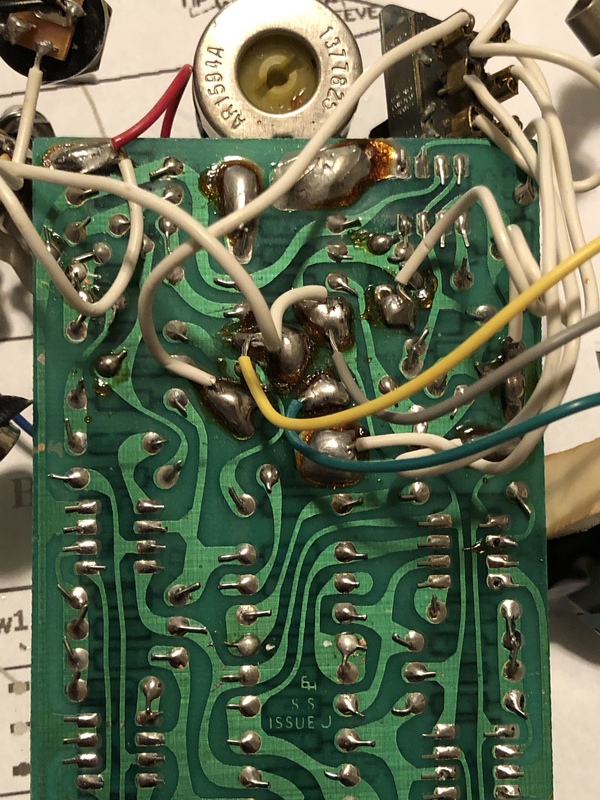 This particular pedal just needed a bit of love. The first thing was to put in a new battery snap to power the pedal. 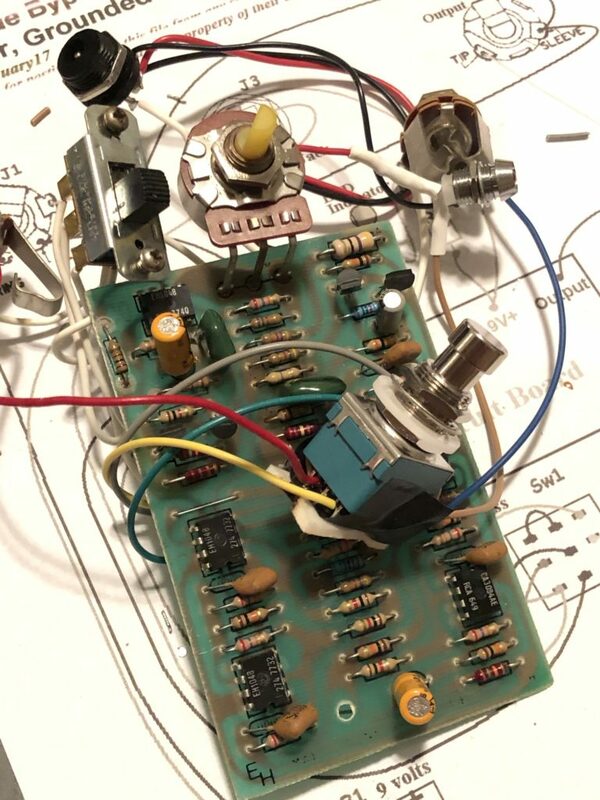 This pedal had a 1/8″ audio jack-style power jack. There are adapters for using this with a modern, Boss-style (2.1 mm barrel) DC power plug. However, it was a pretty simple operation to just drill out the case a bit larger and install a modern power jack. That got the pedal working again and how it stayed for about a year. And it sounded great. Well, except for one issue and it’s why I think this pedal was never nearly as popular as the MXR or, for that matter, many of EH’s other pedals such as the Big Muff π. That is there is a serious volume drop when the effect is on. Imagine Eddie Van Halen turning the effect on for the drop-C# chug in “Unchained” and then back off for the chord progression. The riff would be ruined! 2. So I really wanted to fix that. Fortunately, 40+ years of history with this design and folks have figured out ways to address the issue. There are two resistor values that can be changed that dramatically improve the volume drop. I swapped out R11 and R42 and a quick test (outside of the case) saw the issue improve dramatically. The bypassing mechanism on this pedal was fairly transparent. I personally can’t tell much of a difference when it’s in my signal chain or not. However, I did decide to make it a true bypass pedal along with the other mod, mainly just to add an indicator LED. Though I’m not a serious guitar player and never actually play live (or record), I do like having indicator lights on effects. If nothing else, it just reminds me to turn them all off when I’m done playing for a bit as a break during work hours! The updated switch, even just a cheaper “Taiwan blue” is still a lot less of a “ka-chunk!” than the old switch, too. The last step was to drill out the hole for the LED bezel. Drilling steel is a bit harder than aluminum. I used a step bit as usual, but cutting fluid is a must in this case. Unfortunately, a couple of steel shavings scratched rings around the opening as I was drilling. I can probably buff them out, but a simple piece of painters tape would have protected the surface when drilling (and I usually think of that when it’s a powder-coated enclosure!). I boxed up the effect, plugged it in, and SQUEAL-EEE-OOO-EEAAA! Turns out, the output jack can rotate just a bit and short out on the color switch connectors. A small piece of black electrical tape fixed that, though. Reverb has these vintage v7 Small Stone pedals going from between about $150 to $200, depending on their condition (they retailed for around $80 back in the 70’s). Even non-functioning, this one could have sold for $75-$100 (which would have easily covered the cost of a modern “Nano” re-issue model). So did I reduce its value? Maybe. Maybe not. There are some modded Small Stones also sold on Reverb going for even more. Many of those have additional controls added or the ability to attach expression pedals or other more significant modifications. However, none of that is really the point for me. I think it’s really cool that this particular one belonged to someone in Angela’s family (most likely her late uncle, John, who played guitar some). I think of all the effects in my collection, this would be one I’d never really want to part with anyway. It’s got some real history; used by people I knew. And it’s been fun to take it and make it hopefully even better than before. It sounds great and though it may not have been the phaser I would have bought otherwise, it’s even better to me. Some notes on that demo: first of all, it’s just recorded from my iPhone X on a tripod (as if the leg wasn’t the giveaway). The iPhone attempts to level out sound, so trying to show that the volume doesn’t drop when the pedal is engaged in this recording isn’t too useful. Next, even though you can clearly hear the switch clicking, it’s truly just because the amp volume is relatively low. There’s no pop through the amp. Lastly, I’m barely passable at playing this riff and trying to coordinate the pedal on-and-off with it was a particularly challenge for me. Previous Previous post: Burying or Embracing the Past?